"The Home of Van Accessories"
Buying on-line speeds up delivery. If you want the best advise backed up by a proven range of van accessory products then "Vanbitz" is your one stop shop. It's true to say that most light commercials will become working vans. Some as part of a fleet for large blue chip companies and other's for the humble tradesman. One thing unites both van operators. The need for efficiency. By maximising the carrying capacity and the order in which components are stored increase's efficiency and by increasing vehicle efficiency will increase productivity. How many times do you see the inside of a workmans van, to see a huge pile on the floor. For the sake of a few cheap van shelves would solve the problem. Shelving the inside of a van should be one of the first things done to a working van. Once it hits the road and it's out there working, the chance of it ever getting done would be nil. The ability to carry more will increase vehicle efficiency and productivity. Van roof bars are relatively inexpensive and will allow long lengths such as ladders to be carried quite easily on the vans roof. If you need to carry large awkward loads the a heavy duty van roof rack is more suitable. A van roof rack is a framework style roof rack generally the length and width of the vans roof. Being all in one piece helps disperse heavy loads correctly through the vehicle to the ground. 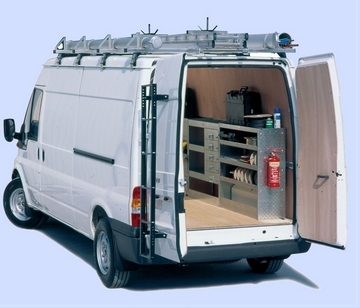 There are two main types of van roof racks, a Contractors style roof rack and a Luggage or basket type roof rack. The contractors rack will be open ended allowing long lengths to be carried, with up-stands down the side helps secure loads and a roller at the back will help loading. The luggage type van rack is generally used by minibus operators and taxi operators. This too will generally be the length and width of the vans roof but now the rack has sides all the around it. Ideal for luggage and even camping equipment for school buses. We are probably best known for our range of van side racks. Some refer to these as a glazier rack or glass rack. Ultimately they are all the same. Our van side racks are universal which makes us the cheapest manufacturer of this type of van racking. All our external van racking is produced from aluminium which as you probably know is very strong while remaining very light. I can never understand people who buy heavy van racking and then run round with it empty. All vans have a carrying capacity. So what's the point decreasing the vans capacity by fitting a rack the weighs heavy into the vans carrying capacity. This will also have a very negative effect on fuel returns too. By fitting light weight (not light duty) van racking won't impede on the vehicles carrying capacity nor the fuel returns. Van Security has come along way. Unglazed rear doors, up-rated locks, bulkheads are all improvements the industry has seen in recent years. Unfortunately not all vans are produced with these security devices. So on our van security page we have a comprehensive range of Van locks. Not just the usual slam and dead locking locks but concealed electro shoot bolt locks driven by the vans alarm system. The old smash and grab are protected by window guards bespoke for each vans window recess. Which again applies to the vans bulkhead. this is partition between cab and cargo area. Car alarms are usually ignored now-a-days so the next generation are paging or SMS alarms. texting you if your alarm is active. Vehicle trackers are great deterrents for the vehicle thief., and our van trackers are inexpensive and can be run without subscription. Vehicle Health and Safety is a subject that is usually ignored by the driver owner and something of great importance to the larger fleet operator. This is usually because the fleet operator understands they are liable if an employee needs first aid and is injured or the injury becomes worse from the negligence of the employer not providing suitable care. It really doesn't take much. A first aid kit, fire extinguisher are the basics. Hygiene can be catered for by a hot water dispenser, Soap, towel? etc. Van Steps and Hi-Viz Grab handles will help solve any access liabilities. A rotating van roof vent will help conform to vehicle ventilation regulations. is good business sense. At the end of the day one van or a fleet of vans is an asset, and this asset needs to be protected. Or rather the resale value needs to be protected. Very few people will buy a vehicle and keep it until it is scrap. Therefore it will need to be sold at some stage. By boarding the van out with a plywood lining kit will certain help protect the vans residual value. Other items like reversing aids, protection bars and rub rails will keep the value high. can be added to any van and can also be trim matched . Our van seats are crash tested to comply with the road traffic act. Complying to M1 and M2 standards. We offer a large range of van seats, Some are standard minibus seats, Others fold and swivel. Some have secure storage built in for tools, some can fold out to make a bed. Quick release seat brackets allow the seats to be removed and vans carrying capacity maximised once again. "Peugeot Partner 2008 on L1, L2 H1 Twin Doors Window Blanks ADV-VG272S"